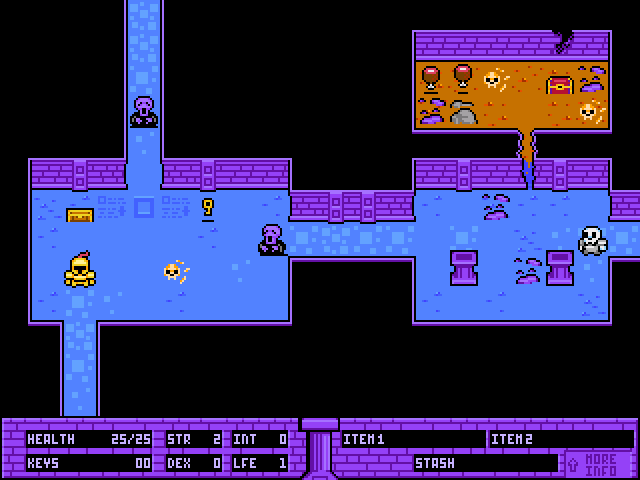 It's a dungeon crawler where you have to save some priests from a dragon. Collect loot and decide what you should carry with you and leave behind as you only have two slots. At the moment the game is pretty unbalanced, didn't really have time to playtest that much. The end boss is way too easy and the game is probably unbeatable if you go with an intelligence based build. Thinking of putting in some extra hours and make an updated version that's a bit more balanced and add some stuff I had to cut. But until then, feedback would be appreciated. Can't try it atm but love the style, also a neat idea with the weapons. Although it probably wouldv'e worked better in a more actiony setting. Definitely following this thread. Once I am done with MoSV, I am so giving this a shot. It looks really fun. Looks fantastic for the time spent! Dude that looks retro and tight! I'm gonna give it a go! This is mondo coolio! How can you go into a game challenge to make a square game and come out with this gnarly schweet looking thing? Cool, let me know what you think. Thanks! It's just rpg maker 2003. I like that idea, but I would probably have to redo the game in something else to make it more feasible. Thanks. Dunno, you sit down, make game. Sitting down is optional though, you can stand as well. i just wOkay, so as promised, I would try this game. I just want you to know, it reminds me of the old days of computer games. Meaning... I LOVED IT!!! If you decide to come up with a sequel, let me know because I am so in. I love these retro style games. The graphics, the sfx, everything. They are not super complicated like my arch nemesis the toaster, and yet not simple to play. This is the kind of stuff I knew as a child, and seeing them again brings me... feelings of some kind. You have paws up from me. The end boss is way too easy and the game is probably unbeatable if you go with an intelligence based build. It is not. Ok I didn't go FULL intelligence because you said it'd be unbeatable, but my intelligence was the highest and it was ok. I should try a full intelligence one next. Great game otherwise. It's pretty well balanced for a game made in such a short amount of time, I've seen much worse. Jams are great (except when it's really stressful)! Good for testing quick throwaway ideas and see what sticks. I love the title screen thingy, but it looks a bit too fancy for the style of the game. Maybe you plan to update the graphics in the new version though so don't mind me. Yeah, I'm changing up the game a lot. Remaking the graphics style to one I like working with more, changing some systems and adding some new. Whoa! There is a lot of improvement here. When it is done, I will play this new version once you send the link.